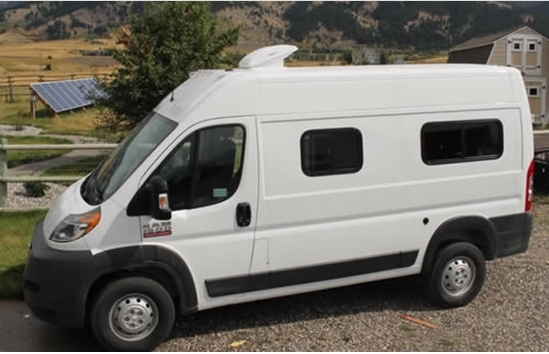 This calculator allows you to experiment with different types of insulation packages for your camper van conversion, and to see how they compare on reducing heat loss (or gain) for the van. This could help you size your furnace or AC, size your heating fuel tank, and to determine how much heating fuel different insulation strategies may use over a few days. The calculator is an Excel spreadsheet. You will need Excel (or something runs Excel files) on your computer to run it — I’ve been told that Open Office works fine. Follow the instructions in the spreadsheet to estimate your heat loss. This is a sample output from the spreadsheet. It shows the heat loss for a non-insulated van in blue compared to my van insulation package in orange. You can download the spreadsheet and plug in the insulation R values for your van and see how it comes out. Example heat loss plot from RV heat loss calculator. Van used for heat loss calculations in the calculator. This shows the window and vent arrangement on the van used for the heat loss calc. There are two PM windows in back door, and one window on the opposite side that is same as larger window on this side. This goes over how I estimated the insulation R values for my particular insulation package — it may be helpful in determining R values for your insulation package. There is also some more information on estimating R values for various insulation types in the next section. Windows are done in the same way as the metal panels — R0.7 inside + R 0.3 outside = R1. This is pretty much the standard for a single glazed window. Infiltration of cold outside air into to the van is a heat loss in that it requires the furnace to heat the incoming cold air up. I used an air infiltration rate of 0.5 air changes per hour. The actual infiltration rate may be significantly different than this, but it does not appear that this would have a large impact on the total heat loss. Accuracy: Real heat transfer is very complicated and depends on more factors than you would ever want to try to keep track of. These one dimensional engineering approximation calculations are just that — approximations. If they end up being within 20%, that would be a good day. But, they are still a lot better than nothing and lots of practical heat transfer design problems are worked successfully with nothing more. Claims: The claims of manufacturers insulating materials should be looked on with a healthy dose of skepticism. The published values for things like fiberglass, polystyrene, polyurethane, plywood, … are well established and reliable, but when you start getting into things that rely on reflective or low esmissivity layers or “space age” developments be careful — look for third party lab tests and for reviews by qualified impartial observers. Reflective Layers: For insulation that incorporate a reflective layer to improve R value, the reflective surface has to face an airspace to be effective. The reflective layer(s) also have to stay reflective over time. For example, radiant barriers in attics lose effectiveness as dust settles on them. Other Factors: R value is not by any means the only important thing to look for in insulation — it has to handle (and maybe control) the moisture levels in the cavities, handle high temperatures, stand up to the mechanical strains of a moving vehicle, not make a lot of noise, … And, it would be nice if it also cut down noise levels. 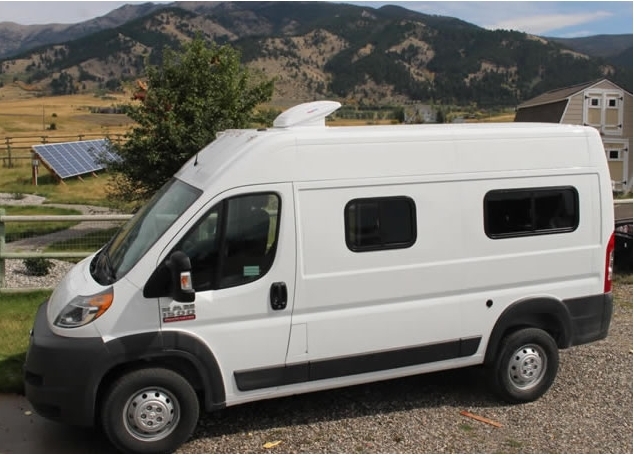 If you look on the ProMaster and Sprinter forums, there are dozens of theories on how best to insulate van cavities — good luck on trying to make sense of it all. It would be nice if the forum community could organize some actual thermal performance tests and evaluate long term durability and moisture performance of various insulation schemes. Thermal performance tests of a van insulation package can could be done with nothing more than an electric space heater, a KillAWatt meter and a couple thermometers — you basically just need to know how much power it takes to keep a van at a constant inside temperature for a known outside temperature. The idea that it does not make sense to insulate the metal walls/ceiling/floor because you have big windows does not pan out. The big losers are the huge metal surfaces and even if you don’t insulate the windows at all, you can achieve very large reductions in heat loss by insulating walls/floors/ ceiling. I believe that this logic comes from home building where typically windows make up a lot of the home heat loss because they are poorly insulated and walls are well insulated — in the van, everything starts out very poorly insulated, so it pays to insulate everything. My insulation package achieves an about 80% reduction in heat loss. For me, on winter trips, this is enough to 1) allow a much smaller furnace even for very cold temperatures, 2) achieve a week or so of operation on one small five gallon propane tank, and 3) save a few bucks on heating fuel. The small furnace and small propane tank free up valuable space in the van. But, the pros and cons will be different for everyone’s unique situation. Had a little trouble searching this page for specific information. Did you use spray foam as your sole material? I think that stuff off-gasses some pretty toxic fumes, and even more so with the kind of heat a van is exposed to. Might be useful info for anyone beginning their build. When actually spraying the foam, there are toxic fumes, but once the foam is cured it does not give off toxic fumes — this is based on quite a bit of reading I did before going this way. The spray urethane foam is used a lot in new home construction. have you done a thermal evaluation using an electric heater? do they verify your heat loss? my sprinter is “almost” all insulated, and i’m surprised by the heat loss. my recollection is 1200 watts of heat only raises the internal temperature by 15 degrees. I’ve not done a check with an electric heater — will try to do that after Christmas. My past experience with this kind of heat loss method where Heat Loss = (Area)(Tin-Tout)/Rvalue do tend to under predict the actual heat loss. We kept track of propane use on a winter trip, and I would say that the average propane use per night of 0.58 gallons is somewhat more than the calculated heat loss would give.